Osei Tutu is one of the leading modern proponents of highlife music. He is named after the legendary 18th century warrior king of the West African Empire of Ashaniti, and he is a member of the modern Ashanti Tribe in Ghana. The present day King of the Ashanti shares the same name – Otumfuo Osei Tutu II – but I have not found anything to suggest the two are related, except through the love of music. Highlife is a musical mutt. It began in Ghana in the early 1900’s as a mingling of rhythms and percussion of West Africa, the blasting horns of European military brass-band music, and happy melodies of Pacific islands. Into its musical mashup, highlife has, through the decades, accreted calypso, son cubano, American swing, rock and roll, Western pop, reggae, R&B, gospel, hiphop, and any other genre that caught the ears of its devotees. All the while, it has been rooted in the wild dancing party beats that keep its fans jumping until the sun rises. Osei Tutu’s voice is almost conversational, the melodies are sweet and simple, and every syllable is discernable, which contrasts beautifully with the frantic insistent syncopated rhythms on a multitude of percussions. Even a romantic duet with Hannah Lee is underdriven by dynamic patterns on the drums. In the middle of the instrumental, Léandro Acouncha on piano suddenly spins off into a Keith Jarrett-like jazzy interlude. The trumpet and sax blow out blazing accents. Underlying the simple ballad sung by Osei is some of the most amazing drumming I have ever heard. Hubert (The Groove Man) Colau on a trap set and Patrick Gorce on percussions create a completely unexpected rhythm track, finding the beats between the beats and poising pauses of unanticipated brevity, all the while driving a rhythm that requires joyous jumping, sultry swinging, and temerous twirling. Claude Di Bongué and Osei Tutu, “Enyimema,” No publisher (No date). 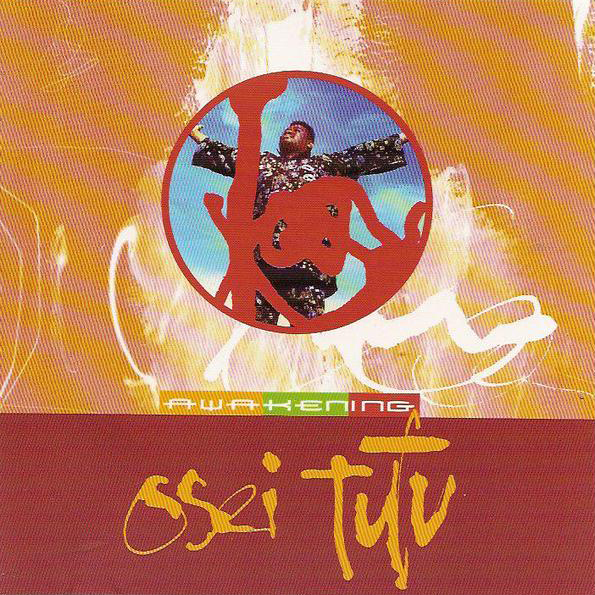 From: Osei Tutu, Awakening, Tinder Records, 42854832 (No date). Album design – Christine Lemeur and Shaun James; Photography – Emmanuelle Margarita.